Chinese President Xi Jinping stressed self-reliance amid “changes unseen in 100 years,” as the country faced an economic slowdown and a more confrontational US under President Donald Trump. In his annual New Year’s Eve address, Xi stressed China’s capacity to weather the storm, citing a series of industrial and technological achievements in 2018. He said the government would keep growth from slowing too quickly and follow through on a tax cut as part of an effort “to ease the burden on enterprises.” On the other hand, in a congratulatory message on Tuesday to mark 40 years since the establishment of diplomatic relations between China and the US, Xi told Trump that history shows that cooperation is the best choice for both countries. Xi and Trump also spoke by telephone over the weekend. Trump said he had a “long and very good call” with Xi and that a possible trade deal between the US and China was progressing well. In his speech to Chinese citizens on Monday evening, Xi said: “Despite all sorts of risks and challenges, we pushed our economy towards high-quality development, sped up the replacement of the old drivers of growth, and kept the major economic indicators within a reasonable range,” Xi said. China’s factories slid back into contraction territory in December, with the manufacturing purchasing managers index dropping to 49.4. Meanwhile, a US delegation led by Deputy Trade Representative Jeffrey Gerrish was preparing for talks in Beijing next week that would test a tariff cease-fire established earlier in the month by the two sides. Trump said he and Xi spoke at length and that “big pro­gress” is being made toward a deal. Next year marks 70 years since Mao Zedong led the Communist Party to power — a milestone that would surpass the Soviet Union. 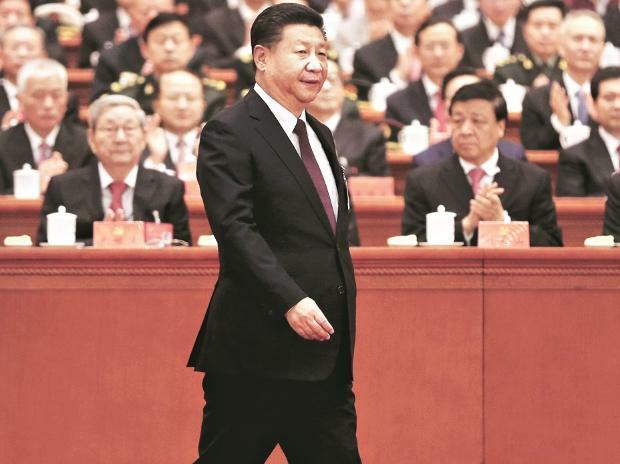 The anniversary underscores the urgency Xi faces in turning around stalled growth and investor confidence, while pushing forward an agenda of political reform that will strengthen his power.